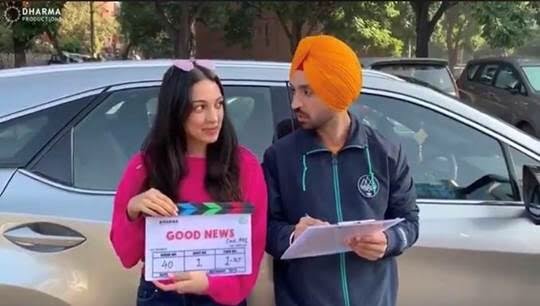 Filming has begun for for Good News starring Akshay Kumar, Kareen Kapoor, Diljit Dosanjh and Kiara Advani, directed by Raj Mehta. Good News is a hilarious family drama where Akshay & Kareena and Diljit & Kiara play married couples trying for a baby. The film is a Dharma Production. Good News is expected to be released on July 19th 2019. The announcement of the film going to the floor was done in a very cute and unique way! Check it out! In the video clip, Diljit asks where all the members are. He has a checklist of names in his hands; as he takes the names of crew of the film, he also ticks the name off the register. Director Raj Mehta is spotted, but other members are still to join in. Diljit reminds Kiara that Akshay Kumar doesn’t like people getting late. Finally, Diljit addresses Akshay (not in frame) and says that everyone is ready and in time and that he is being missed. Kiara chimes in, addressing Kareena and saying the same. They both announce that the shooting of ‘Good News’ has started.